Cardinalis cardinalis a zo ur spesad golvaneged eus ar c'herentiad Cardinalidae. Anvet e voe Loxia cardinalis (kentanv) da gentañ-penn (e 1758) gant an naturour svedat Carl von Linné (1707-1778). Dougen a ra ar par pluñv ruz heñvel o liv ouzh hini dilhad ar gardinaled katolik. Bevañ a ra diwar c'hreun dreist-holl ha diwar amprevaned ha frouezh ivez. C. c. yucatanicus, e deroù Ledenez Yucatán (gevred Mec'hiko). 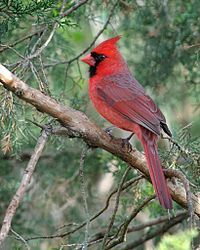 (en) Cardinalis cardinalis war al lec'hienn BirdLife International. (en) Cardinalis cardinalis war lec'hienn an International Union for Conservation of Nature (IUCN). ↑ (en) Cardinalis cardinalis el lec'hienn HBW Alive: Handbook of the Birds of the World Alive. ↑ (en) Roadennoù IOC World Bird List diwar-benn Cardinalis cardinalis. Kemmoù diwezhañ degaset d'ar bajenn-mañ d'an 21 Ebr 2018, da 13:20.